Hurricane Michael was upgraded from a tropical storm as it churns in the Gulf and is forecast to become a major Category 3 storm when it makes landfall in the Florida Panhandle later this week. Already a Category 1 hurricane with sustained winds of 90 miles per hour, Michael is traveling north at a rate of 12 miles per hour. The National Hurricane Center predicts that Michael will reach major hurricane status on Tuesday night or Wednesday morning as it nears the coast with sustained winds of 120 mph. Florida Gov. Rick Scott has now declared a state of emergency in 35 counties ahead of Michael's predicted landfall on Wednesday. "Hurricane Michael is forecast to be the most destructive storm to hit the Florida Panhandle in decades," Scott said at a press conference Monday evening. The Federal Emergency Management Agency has mobilized resources from the federal government to assist with the preparation. "The Panhandle and Big Bend could see winds in excess of 100 mph," Scott said at a briefing Sunday evening. "Remember, this storm could grow stronger and be a Category 3 hitting our state. This storm will be life-threatening and extremely dangerous." Mandatory evacuations were ordered in parts of Panama City Beach starting Tuesday morning. The National Hurricane Center announced the upgrade from a tropical storm at 11 a.m. Monday, making it the seventh named hurricane of the year. 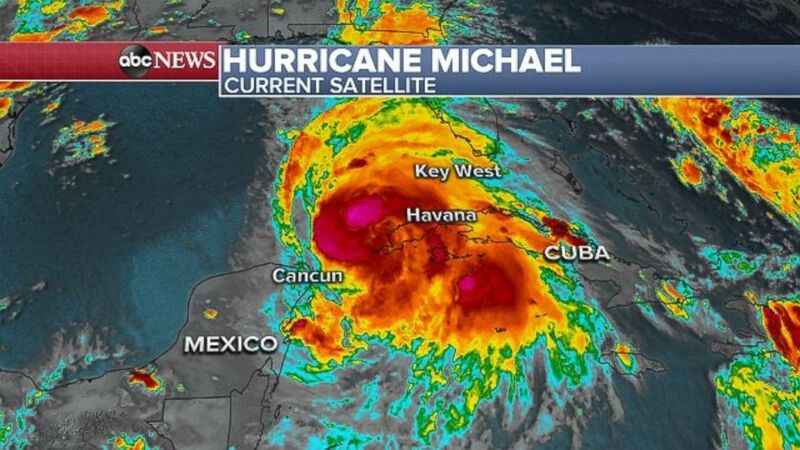 Michael was delivering rain and wind to western Cuba on Monday evening. 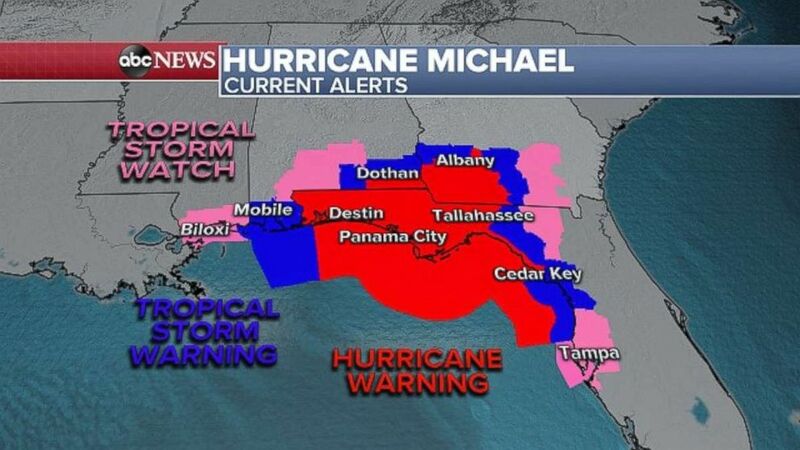 Michael is currently located 450 miles south of Apalachicola, Florida. A hurricane warning remains in effect for Cuba as heavy rain and strong winds are hitting the western part of the island. The National Hurricane Center is forecasting storm surge between 8 and 12 feet in certain areas, Scott said Monday. The NHS warned of a "risk of "life-threatening storm surge." The Tampa area could see a 2 to 4 foot storm surge. A hurricane warning is in effect for the Florida Panhandle and Big Bend. The storm will move further inland later in the week and bring rain and wind to Georgia, South Carolina, North Carolina and Virginia. The Carolinas and Virginia were blasted by Hurricane Florence last month, which dumped more than 2 feet of rain in some locations and caused record flooding. The biggest rainfall from Michael is expected across parts of the Florida Panhandle and Georgia, with 6 to 10 inches expected. The coast could get up to a foot of rain. The majority of the rain will fall between Wednesday and Thursday morning. "Early preparations are key to keeping you, your boat and maritime responders safe," said Capt. Holly Najarian, the commander for Coast Guard sector St. Petersburg. "With forecasts indicating that the storm will strengthen as it moves into the northern Gulf of Mexico, BP is in the process of evacuating personnel," the company said in a statement. 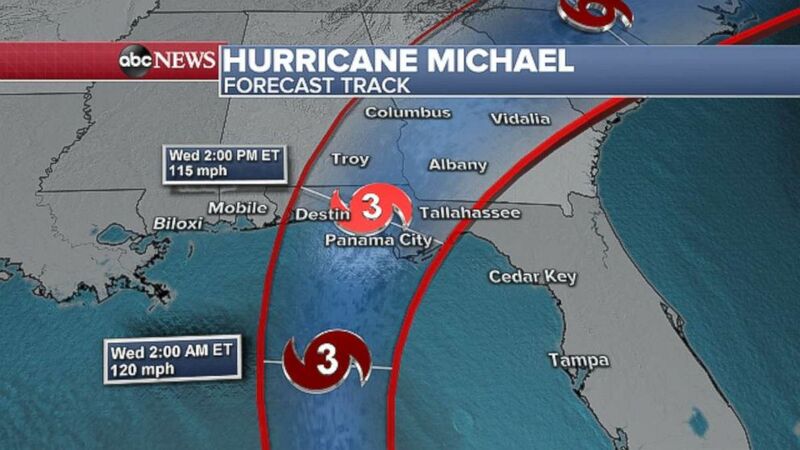 Michael could make landfall as a Category 3 storm on Wednesday. "Students are encouraged to discuss possible travel plans with family and friends," the school warned in a news release.